Hurtigruten's 3 step reward programme! 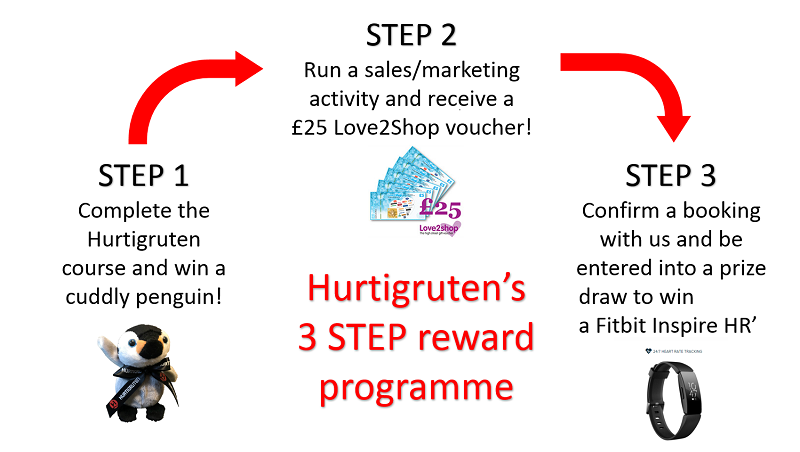 Email through proof of sales and marketing activity for Hurtigruten to uk.agency.sales@hurtigruten.com and receive a £25 Love 2 Shop voucher. Activity can be through Social Media, in branch, mailers or events. We hope that you have benefitted from the course and that you feel ready to sell our products successfully! Should you have any questions please send an email to the address above and we'll be happy to answer them for you. *Prizes only available to UK&IRE agents. Only one voucher per travel agent. Booking needs to be made after course completion and after sales/marketing activity. Prizes/vouchers cannot be exchanged and have no cash equivalent. Bookings must be for five nights or more and must be made after steps 1 & 2 have been completed. The winner of the Fitbit competition will be announced after 30th September 2019.